I begin to add more color to the canvas and am rethinking about keeping it strictly like an old time photo. Did I mention that I am also related to Gus and Yia Yia? Gussy is my cousin. 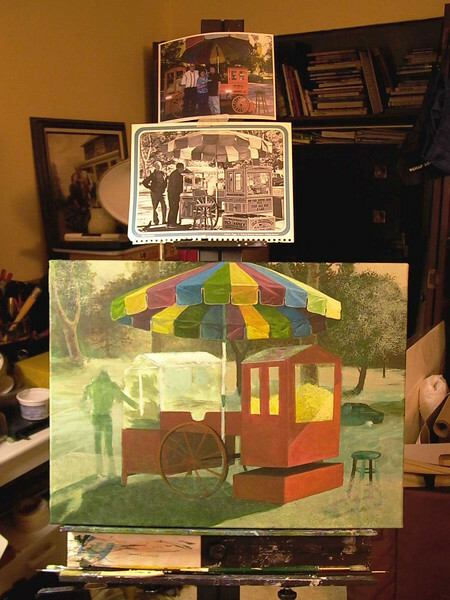 The commission work was requested by my Aunt who remembers the many good times they had as children and visiting the popcorn stand in Pittsburgh. With the umbrella being such a colorful symbol and draw to people passing by, I've decided to just keep adding the color (which I'm half making up and half using photos from other sources).